The Federal Government has begun a national advertising campaign calling on Not for Profits to apply for funding to deliver services from January 2015 under its new grants arrangements. The applications open on Thursday, June 19 for organisation to apply to the Department of Social Services for funding for programs around Families and Community, Disabilities, Mental Health and Carers, Housing and Homelessness, Aging and Service Improvement programs. The funding for peak bodies and other service improvement initiatives are included and comes under the Community Improvement programs. DSS said the funding opportunities were available for existing and new service providers. 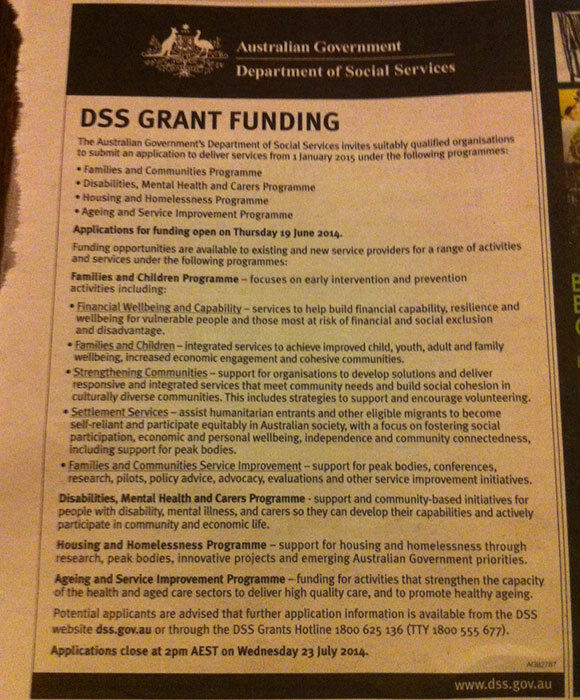 The Department of Social Services’s national advertisement on the new grants arrangements. In May, Federal Social Services Minister Kevin Andrews said the Government’s new grant arrangements for the Not for Profit sector, set for July, will reduce red tape and give service providers greater flexibility. Minister Andrews made the comments in his speech at the Building Partnerships between Government and Not for Profits conference in Canberra. To view a diagram of the Government’s new grant arrangements, click here. The DSS application information is available at dss.gov.au and close Wednesday, July 23.